Right now at the time of writing, these medium to large mushrooms are out there in force. Large, dense groups swarm around tree stumps or at the bases of living deciduous and coniferous trees. The Honey Fungus (Armillaria mellea) or Boot-lace Fungus (for reasons I’ll explain later) can appear early in the season, from summer onwards straight through to early winter. I usually find them on the cusp between summer and autumn – although this may be just coincidence. It is a dangerous parasitic species of trees and plants (of which there is no cure). 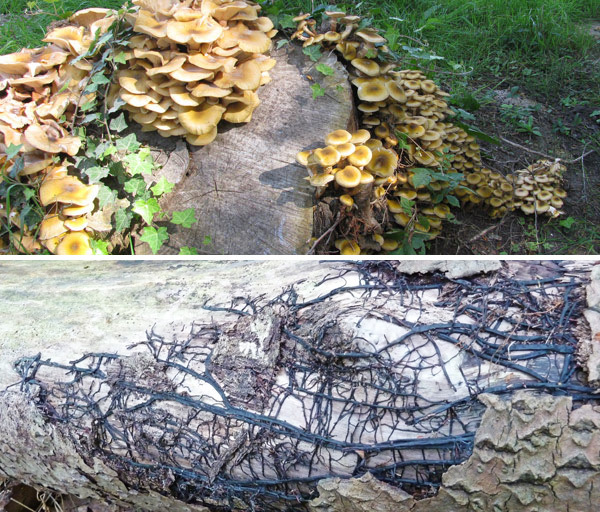 The exchange of nutrients between the fungus and tree is an extremely bias one, in favour of the fungus as it takes more from the tree than it gives back, causing white rot and eventually killing off the host tree. Much timber is lost every year due to Armillaria mellea and is a great danger, not to mention being a horticulturists worst nightmare! However, they are impressive mushrooms to behold when in many numbers (which is often). Enormous groups can cover large parts of a tree, sometimes in clusters of up to (and over) a hundred at any one time. Very impressive indeed. 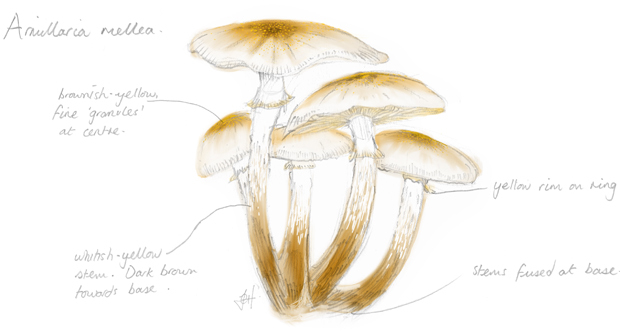 When young, the shallowly domed caps are honey coloured with tiny, darker coloured fibrils covering the surface, especially at the centre. As they grow and the cap expands and is variable in shape, ranging from broadly convex, depressed at the centre and often wavy and irregular at the margin. The colour is not so intense with age, they are more yellow/ochre almost always with a darker centre, retaining some of the fleck-like scales on the surface. The long whitish-yellow stems are darker reddish-brown towards the base where several stems all fuse together. Whitish fibres can also bee seen vertically streaking along its length. The whitish ring, high up near the cap has a yellowish tinge and the white gills soon change to pale yellow, often becoming blemished with darker spots as it ages. Just in case you’re wondering the ‘Honey’ reference defines the colour of the cap and not the taste. That may be obvious to many, but I just wanted to set the record straight! However, they are an edible species and MUST be cooked before consumption. They aren’t for everyone though, some people can suffer gastric upset, so if you intend on eating any always try a small portion first to see how you get on. If you do alright, try this great little recipe here: Spaghetti with Honey Fungus. Simple and tasty. Honey Fungus and their Boot-laces! Just like something out the ‘Day of the Triffids’, this fungus spreads to infect new trees by means of black cords called rhizomorphs, made up of parallel hyphae (the branching filamentous structure of a fungus). They resemble long black boot-laces (hence the use of the common name), creeping long distances to reach neighbouring trees. Rhizomorphs can be seen on roots or in the soil, but older boot-laces are often noticed under the bark of infected trees (see image below). 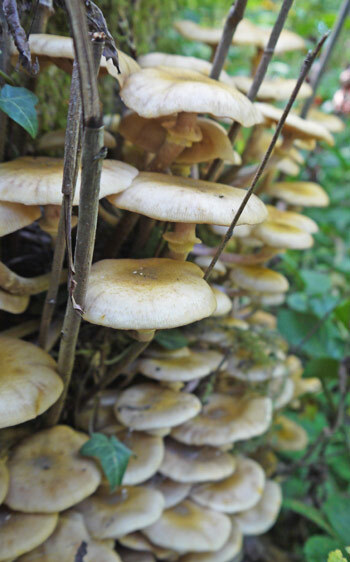 Honey Fungus (Armillaria mellea) often grow in large clustered groups. Notice the difference between the younger (bottom right) and older examples. 3-14cm across. Initially rounded/domed. Expanding into variable shapes including shallowly domed, depressed centre and/or wavy margin. 6-15cm x 0.5-1.5cm. Often tapered at the very base. Fine white fibre streaks. Whitish-yellow. Reddish-brown towards base. White, then pale yellow. Spotted dark brown with age. Growing on stumps or trunks of deciduous or coniferous trees – or growing from the roots underground. From Summer to early winter. Edible. Must be cooked. Some people may suffer gastric upset. I own a small wood. I have noticed honey fungus in the wood and I have noticed it on a couple of sick trees. There seems to be nothing I can do about it. Presumably as its a native species, it comes to a natural balance in native woodland and doesn’t rampage in woods, like it does in gardens?